Love that Redbooth enables all of my virtual employees to stay connected. Love the advantage of being able to invite just the people necessary to different groups. I like that I get email notifications when coworkers make notes to a task and I can reply to the email and my comment automatically gets put on the task. 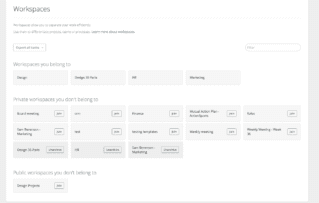 You can’t sort your tasks on the dashboard and you can’t have the same task in multiple workspaces unless you copy the task but then the comments don’t follow. I like that I get email notifications when coworkers make notes to a task and I can reply to the email and my comment automatically gets put on the task. You can’t sort your tasks on the dashboard and you can’t have the same task in multiple workspaces unless you copy the task but then the comments don’t follow. Ability to assign tasks to other people. Ability to collaborate on projects with multiple tasks. Ability to see completed tasks. Email responses, no need to login to reply. Requirement to be a part of the group that you are assigning tasks. Possibility of being assigned tasks that should not be yours. 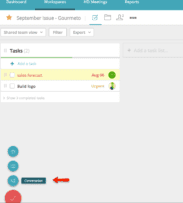 More visibility between departments on status of larger tasks, broken into smaller tasks. Ability to assign tasks to other people. Ability to collaborate on projects with multiple tasks. Ability to see completed tasks. Email responses, no need to login to reply. Requirement to be a part of the group that you are assigning tasks. Possibility of being assigned tasks that should not be yours. More visibility between departments on status of larger tasks, broken into smaller tasks. Mobile app, alerts, responsive website. Cons: Google SSO / Mobile App design and price The UI has changed a bunch over the last few months. It is now responsive and has icon placement pretty much where you’d expect to find things. The chat is helpful. Task templates make a great boilerplate for similar tasks, perhaps the checklist used to add a new user to your system. It is a bit expensive and the mobile app doesn’t currently work well to remember who you are logged in as if using Google SSO. Mobile app, alerts, responsive website. The UI has changed a bunch over the last few months. It is now responsive and has icon placement pretty much where you’d expect to find things. The chat is helpful. Task templates make a great boilerplate for similar tasks, perhaps the checklist used to add a new user to your system. It is a bit expensive and the mobile app doesn’t currently work well to remember who you are logged in as if using Google SSO. I get lost at times when trying to keep track of all the task i am set to do for our company. 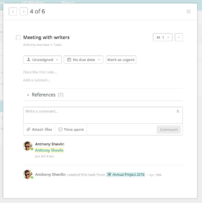 Redbooth allows you to keep track and mark off your task once completed. You can even mark them as high importance so they are at the top of your list! You can have many categories so you can keep track of your task for each department or section you are working on. You have to check daily. I wish they would send you reminders by email on task that are upcoming or due on the day or even over due. Redbooth is a work organization platform. 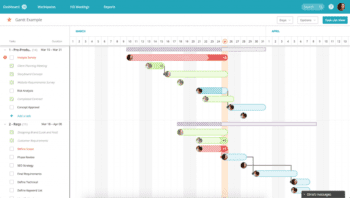 In addition to assigning tasks with due dates, Redbooth includes advanced features such as timelines, Gantt charts, reports, web forms, HD Video meetings and automation. Redbooth also includes a collaboration tool although it is somewhat simplistic and does not currently include 1:1 chat. This feature is slated to be added in the near future but only as part of the Business and Enterprise plans. The Redbooth platform allows for a lot of organization in a very easy to use interface. The technology is in a state of constant development and continues to improve with new features being added. Currently, over 3,000 companies are using Redbooth including Unicef, Ritz Carlton and NBC. What Do You Think of Redbooth?